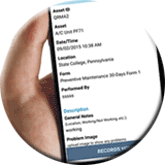 Collect data, assess equipment or property conditions, report damage and request service in the field instantly using smartphone, QR code scanning and mobile forms. With real-time, accurate information being submitted from the field, you can plan your actions better and be more productive. QR Mobile Data will help you get there. Your employees will be able to collect data, assess equipment or property conditions, submit damage reports or request service in the field using mobile forms on their smartphones. The process of data collection is fast and easy with QR Mobile Data mobile application. Scan QR code, fill out a mobile form, take photo(s), submit to the cloud. From this moment all authorized team members can access collected information and can act on it quickly. 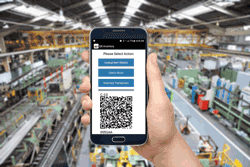 Label your items with QR Codes - and field employees will accurately identify an object, access object information and relevant mobile forms instantly by scanning QR code label with a smartphone. Manage assets, equipment, properties or other business objects that your are working with via the web dashboard: add, update, delete, import. Create custom fields to hold all information that you want to keep track of. Include everything that employees may need to access in the field. It can be instructions, specifications, procedures, images, urls to the object documentation and any other essential information. 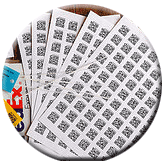 Generate, download, lay out and print QR code labels using QR Mobile Data built-in QR code generation tool. If your assets are already labeled with QR codes or barcodes, or have NFC tags - you can use existing tags or labels with QR Mobile Data. If an employee scans an object which is not in the system yet, (s)he can enter it into the system on the spot using a smartphone. After this (s)he can proceed to the data collection task right away. An employee can access object information in the field, and update data if required. For example, he may take and update a tree measurements, take an additional photo, or do other required updates. Create custom mobile forms via a web dashboard, and your employees will access these forms in the field on their mobile devices. No matter what type of data you need to collect, you will be able to create a mobile form that fits your needs using QR Mobile Data web interface. Create custom mobile forms for field data collection via a web dashboard. Make sure your data collection forms are current. If you adjust a process or requirements, update a form via the web dashboard - and your employees will have an updated form on their mobile devices to fill out. Add clarifying text, instructions and optionally images to the forms. Make sure your employees know exactly what to do. Speed up data entry and minimize errors. Allow selection from the list or scanning in data when possible. Allow employees to add images and collect signatures as part of the process. Make sure that forms are filled out correctly and there is no missing information. Specify which fields are required, and what data type should go into each field. The forms will be automatically validated on submission, and errors corrected on the spot. Make your entire workforce more productive and efficient. Give field technicians data collection tools which guide them through the process, allow fast and error free data collection. Give managers real time visibility into the business operations, assets conditions and reported problems. Allow an entire team to coordinate their work and make better business decisions. Give your field employees a data collection tool which allows for instant information access, fast data entry and is easy to carry around - a smartphone. QR code scan identifies an object and brings up all data that field technician might need - object information, past records and mobile forms for data collection. An employee has an option to continue with the form he started before (if applicable), or start a new record. An employee can use a smartphone to take photos and make them a part of the form. Completed form is automatically validated to make sure that all required fields are filled out, and entries correspond to their data type. Once form is completed and validated, it is submitted to a centralized cloud location. At this point all authorized team members can access collected data. If signature is required, it can be obtained on a smartphone and submitted along with the form. No data connection - no problem. The form can be completed offline and submitted when connection becomes available. Improve communication flow in your organization. 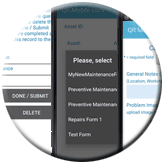 Give managers and office employees real time access to assets conditions, reported problems and service requests. Make sure that urgent problems are taken care off fast. Data collected with mobile forms are sent to a centralized cloud location. From there data are available in real time to field employees on their mobile devices, and to office employees via the web dashboard. Managers and office employees have a real time view of the assets conditions, problems, damages and requests. Real time information helps them organize the work efficiently and make sure that urgent problems are fixed without delay. 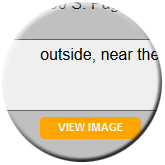 Records are searchable by multiple parameters, so it is easy to find the exact information you need. Review and analyze historic data via online reports. Export collected records for importing into another internal system or software.